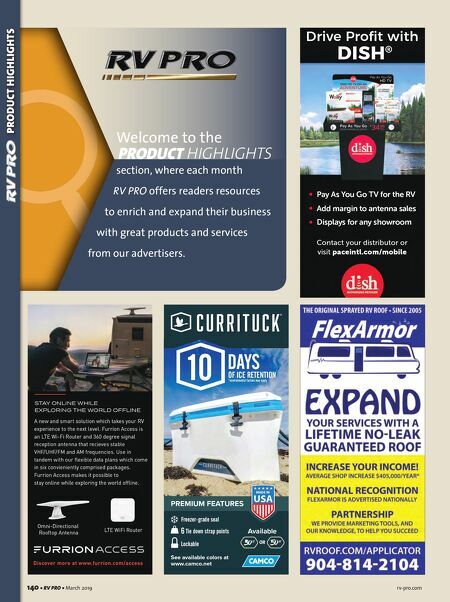 PRODUCT HIGHLIGHTS rv-pro.com March 2019 • RV PRO • 141 DRIVE YOUR BUSINESS WITH • F&I Products • Claims Administration • Service • Training • Technology 800.579.2233 | agwsinc.com Automatically closes the screen door * and keeps pests out! Close the screen door! " " How does it work? The Screen Shot is designed to install snugly into the inner channels of your screen door frame, held in place with anchor screws. The Screen Shot's elastic webbing is affixed directly into the door jamb, expanding when the door is opened and then pulling the door shut by itself. FEATURES lippertcomponents.com For more information about Screenshot or any of our other products, visit our website: * Fits ONLY Lippert Components entry doors; check the door's identification sticker, typically located on the entry doors inside frame before ordering (most LCI entry doors have an LCI decal in the bottom right-hand corner of the entry door window as well) • Patent pending design automatically closes the screen door when left opened • Easy DIY installation • Keeps unwanted pests out of your living space • All required fasteners included 2018 7 X READERS' CHOICE GOLD AWARD WINNER 2012 - 2018 THE BEST PERFORMING SWAY CONTROL HITCH IN AMERICA equalizerhitch.com 800-478-5578 EQ_rv-pro-vertical-ad-jan-19_v01.indd 1 2/14/19 10:59 AM Manufactured and Serviced in the USA Learn More: (269) 781-4241 www.progressivedyn.com PDI PLUS – Lifetime Extended Warranty for Inteli-Power Converters PURCHASING INSTRUCTIONS: • Log on to www.progressivedyn.com • Click on Sales link • Click on Warranty Information link • Click on Extended Warranty • Enter Converter information • Select Add to Cart *To take advantage of this offer you must register your converter within limited two year warranty of the original purchase. Only $ 99.95! 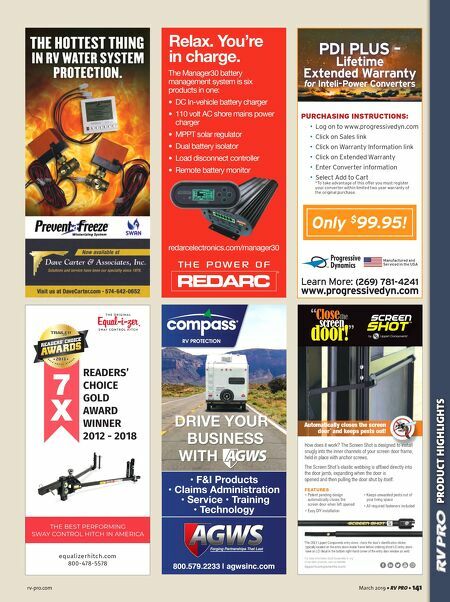 The Manager30 battery management system is six products in one: • DC In-vehicle battery charger • 110 volt AC shore mains power charger • MPPT solar regulator • Dual battery isolator • Load disconnect controller • Remote battery monitor redarcelectronics.com/manager30 ® Relax. You're in charge.